The Venezuelan government has accused the Trump administration of giving the green light for a series of crippling power failures in Venezuela, which affected 22 of Venezuela's 23 states, including the capital of Caracas. The long-duration power failures were cited by US Secretary of State Mike Pompeo as a reason for the US withdrawing its diplomats from Caracas. Venezuelan President Nicolas Maduro announced that an international commission assisted by specialists from Russia, China, Iran, and the United Nations would help his country analyze the sources of the Venezuelan electrical grid cyber-attack. Initial cyber-forensics by Venezuela traced some of the cyber warfare being waged against Venezuela to nodes in Houston and Chicago. In addition to electricity, water service was disrupted in Venezuela. From Miraflores presidential palace in Caracas, Maduro tweeted on March 12: "From the Presidential Command Post, we monitored minute-by-minute the progress of the recovery of the National Electric System." 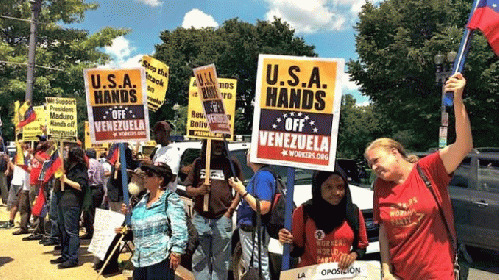 Hybrid warfare against Venezuela, which includes economic, diplomatic, and cyber, has the backing of the neo-conservatives who now call the shots for the Trump White House. They include, in addition to Pompeo, national security adviser John Bolton; Iran-Contra felon Elliott Abrams, Trump's special envoy to the US-backed opposition-led rump Venezuelan government of Juan Guaido; Cuban-American Mauricio Claver-Carone, the senior director for Western Hemisphere affairs at the National Security Council; and Florida Republican Senator Marco Rubio, a Cuban-American, who represents the interests of South Florida's right-wing oligarch exiles from Venezuela and other Latin American countries. While Trump was preparing for his Hanoi summit meeting with North Korean leader Kim Jong Un, Trump's second summit with Kim, Haspel's CIA dug into its old bag of black operations, while also engaging in the more modern form of cyber-attack in targeting North Korea. The Spanish police and National Intelligence Center (CNI) linked two of the embassy invaders to the CIA. "El Pais," a Spanish national newspaper, reported that the CIA issued one of its standard "denials," however, the paper stated that Spanish authorities found the denial from Langley, Virginia to be "unconvincing." "El Pais" reported that the invasion of the North Korean embassy by the CIA had severely harmed relations between Madrid and Washington. The National Police Corps' General Commissariat of Information (CGI) and CNI concluded that the attack and occupation of the North Korean embassy was not carried out by common criminals but was the work of a "military cell" that stole mobile phones and computers. Two of the embassy invaders were identified as Koreans and, based on CGI's and CNI's analysis of security camera video footage, they were further recognized as Koreans linked to the CIA. Spanish authorities did not rule out the possibility that South Korea's National Intelligence Service assisted the CIA in the embassy invasion. The embassy invaders escaped from the embassy using two North Korean luxury sedans bearing diplomatic plates. The cars were later found abandoned. The criminal inquiry into the incident is now before the Spanish High Court, the Audiencia Nacional, which could order the arrests of the embassy attackers and, if they are in the United States or South Korea, have Spain's INTERPOL national bureau put out a Red Notice for their arrest and extradition to Spain to stand trial. Spanish authorities believe the CIA's embassy attackers were looking for information on Kim Hyok Chol, the former North Korean ambassador to Spain, who was declared "persona non grata" by the Spanish government in 2017. Kim Hyok Chol, a career diplomat from one of North Korea's elite families who studied French at the Pyongyang University of Foreign Studies and speaks fluent English, is now one of Kim Jong Un's trusted diplomatic advisers on nuclear talks with the Trump administration and he traveled with Chairman Kim to the failed Hanoi summit with Trump. With certainty, Kim Hyok Chol thoroughly briefed Kim Jong Un on the CIA's storming of his old diplomatic post in Spain. When Trump and Chairman Kim met in Hanoi on February 27 and if the issue of the CIA's siege of the North Korean embassy was brought up, that could have been enough to derail the summit. Considering the fact that war hawks like Bolton, Abrams, and Pompeo are now calling the foreign policy shots for the Trump administration, the attack on the North Korean embassy in Madrid, just five days prior to the Hanoi summit, may have been ordered by Washington's neo-con cell with the intention of scuttling the second meeting between Trump and Kim and put on ice any future meetings. The Trump-Kim Hanoi summit was reported to have hit a roadblock over North Korea's request for a partial lifting of US sanctions on North Korea, in return for the continued North Korean moratorium on nuclear testing and a partial freeze on production of fissile material. With the CIA's attack on the North Korean embassy in Spain still fresh in the minds of the North Korean side and the neo-cons' insistence, pushed by Bolton and Pompeo, for complete North Korean nuclear disarmament, the Hanoi summit was destined for failure. And, with Bolton, Abrams, Pompeo, and other dangerous neo-cons in charge at the White House and the State Department -- and Haspel dancing to their tune at the CIA - North Korea and Venezuela are not the only countries currently in the gunsights of the Trump administration.